About five years ago, I rescued an old metal medicine cabinet out of my grandma's garage before it was torn down. I'm not sure what it was used for in the garage, maybe to hold first aid supplies since my grandma had tools in there. I didn't know at the time what I wanted to do with it, but I guess I saw some future potential in it. Fast forward a few years, and Pottery Barn was selling a message center for holding keys, has a corkboard for posting things and provides storage for small necessities. 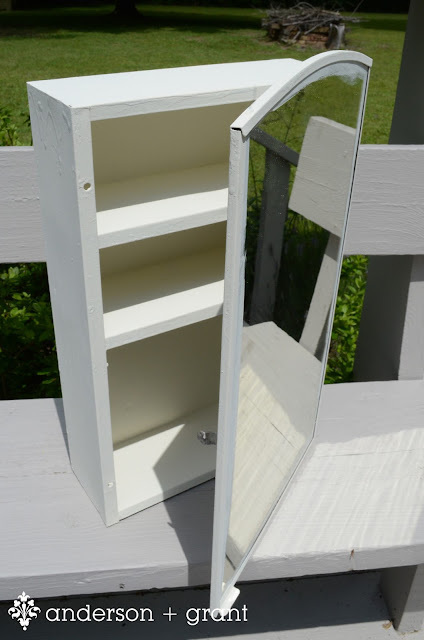 I took on the challenge of making my medicine cabinet as useful as the Pottery Barn message center. 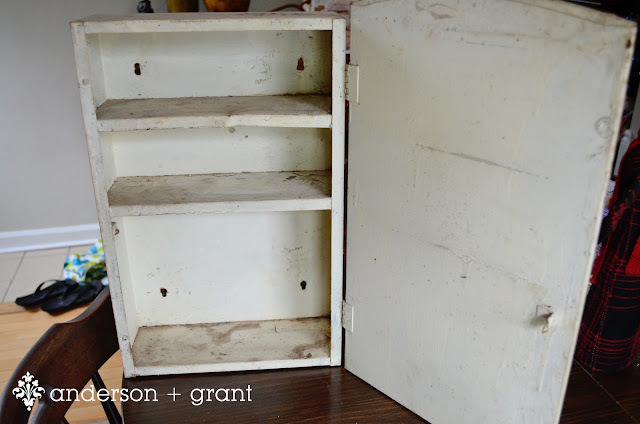 The medicine cabinet started out in very poor shape....It's old and has lived a good, long life. There were layers of paint, a chipped finish, dents, and dings. 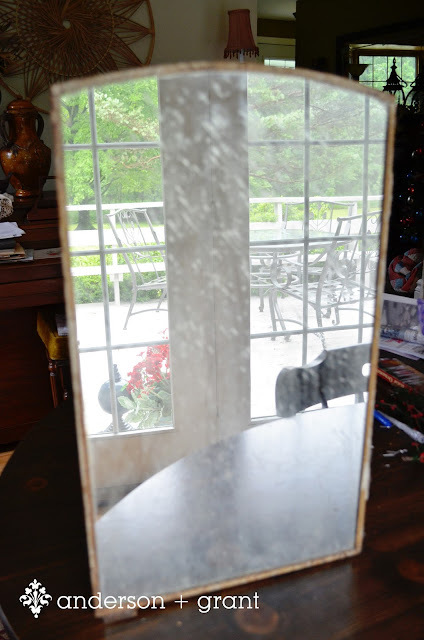 The mirror shows signs of age and has a few scratches on it. A lot of this is hard to overcome, so I decided to "embrace the age" of the piece. I started by cleaning the piece up and then sanding off the chipping paint. It would be impossible to get all the layers of paint and drips off the piece without massive amounts of stripping, so I decided that was part of the "age" I was embracing. 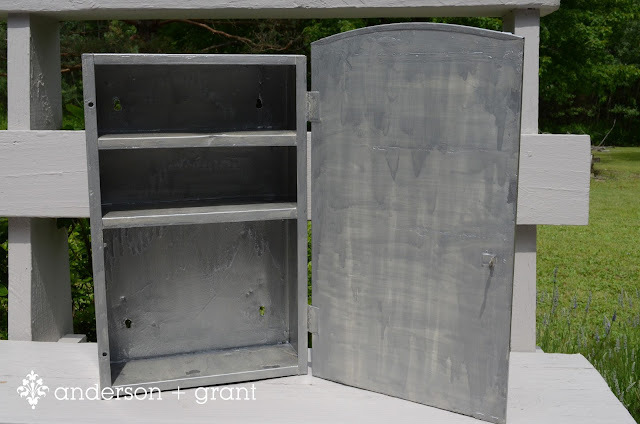 I began by painting the piece with two coats of silver Rustoleum paint....I like to paint all metal pieces with this regardless of the final finish just to protect the paint if later on the rust decides to peek through. I choose silver because I planned on distressing the piece after painting it and figured the silver would make it look like the original metal. Then I painted on FOUR coats of white chalk paint with my Martha Stewart Foam Pouncers . This process takes a little longer to pounce on the paint, but you get a nice textured finish which I like. If you are painting a piece like this, you'll still need to use a brush to get into the corners before pouncing the paint on the center. Between the texture I got using the pouncers and the coverage of the chalk paint, a lot of the imperfections of the old finish disappeared. (Although you can still see some of the drippy original paint there on the corner in the picture below...remember....I'm "embracing the age"!). Tomorrow I will share how I finished converting this into my own version of Pottery Barn's message center. What do you think so far?